To really deal with disobedience, God knows that he must come down himself and deal with it. And so, at the end of our journey through these 11 chapters we are left with the beginning of another one. The people are scattered confused over the face of the earth. Every journey undertaken to this point has been to the East. Adam and Eve banished to the East of Eden, Cain wandering in the East, the Babel hordes moving easterly. 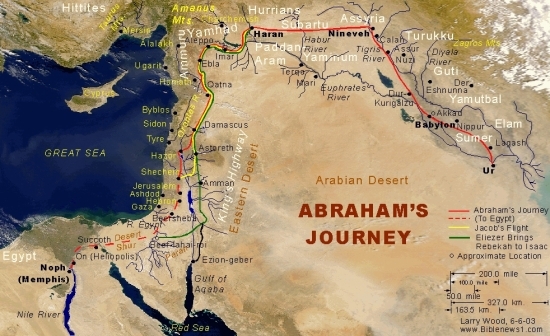 But here we find another man, uprooted from his Mesopotamian homeland and moving by faith into the unknown towards the land of Canaan. Moving incidentally in a westerly direction. Moving back towards God and Eden. It’s going to be a long journey with many ups and downs. But this pilgrim represents the beginning of a new people. A man who, in contrast to the builders in Babel does not strive to make a name for himself, but whose name is ‘made great’ by God’s blessing (Gen 12:1-3) He is the one through whom all the families on earth will be blessed, not by surrendering their identities or their ethnic backgrounds, but by being embraced within the saving purpose of God who rejoices in the diversity of his creation. The message here is that God has not abandoned us.